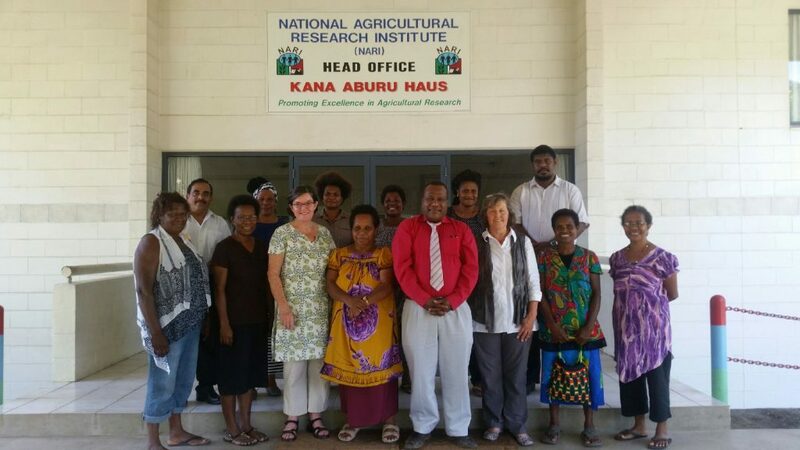 The Papua New Guinea Women in Agricultural Development Foundation (PNGWiADF) this week celebrated 10 years of service as the voice of women farmers in the country. To commemorate the occasion PNGWIADF President Maria Linibi expressed gratitude to the partnerships the organisation enjoyed among business communities, state institutions and stakeholders including the National Agricultural Research Institute (NARI), Trukai, Zenag, Pacific Islands Farmer Organisations Network (PIFON), Australian Women in Agriculture (AWIA), Department of Agriculture and Livestock (DAL) and its registered membership nationwide. Joining Mrs Linibi in the milestone achievement were former executives of AWIA, Cathy McGowan AO MP and Val Lang AM. McGowan is the current Member of Parliament in Australia for the electorate of Indigo Valley in Victoria. McGowan echoed Linibi’s gratitude by thanking the sponsors that made it possible for PNGWiADF’s progress and honoured the organisation’s future as it sets its course and vision for the next 10 years. McGowan and her team provided PNG women farmers friendship since January 2007 when a team of five women including McGowan came to Lae and held talks with Linibi and a group of women to set up PNGWiADF and its organisational structure and a few years later, provided leadership trainings in Lae, Rabaul and Port Moresby through an AUSAID sponsorship. McGowan said that as a Member of Parliament she will continue to tell her colleagues what a wonderful country PNG is, the fantastic food it has, that they should all come up here for holidays, and then import its food. She hopes to do this by making a presentation of her recent visit to a group in the Australian Parliament called the Parliamentary friends of PNG. McGowan also plans to invite Senator Fiona Nash who is the Deputy Leader of the ruling Labor Party and a great supporter to come to PNG to meet with PNGWiADF members and sponsors. Trukai continues to be a staunch supporter of PNGWiADF, through a signing of a five-year Memorandum of Understanding. Managing Director Greg Worthington-Eyre said through the company’s rice programme in the country, they have seen women as the drivers of the economics of the village as they step out to tap into opportunities for their communities and families. He said Trukai will be there for the organisation for many long years, not just as a sponsor but a partner and will be there for the long run. “The next 10 years will be dynamic and Trukai will continue to support the development and achievement of the next 10-year plan,” Worthington-Eyre said. NARI who has housed PNGWiADF in the first 10 years, has pledged to continue its support of the organisation which is now at the crossroads. PNGWIADF is of mutual benefit to NARI as its research is adopted and adapted mainly by women to produce food and provide income opportunities for families for their livelihood. NARI Director General Dr Sergie Bang said PNGWiADF is in a good position to make an input and benefit from the PNG government’s investment in impact projects in agriculture. He pledged that he will ensure that PNGWiADF makes an input in the Government’s Medium Term National Agriculture Development Plan and especially, to contribute to the development of the impact projects in agriculture. Cathy McGowan AO MP also delivered a speech in Parliament following her visit to Papua New Guinea for the anniversary. Click here to watch the video clip. Former AWiA President, Cathy McGowan AO MP, and current PNGWiADF President, Maria Linibi, celebrating the 10th Anniversary of PNGWiADF with Members and supporters.